Today, as the idea of the Great Silk Road revival is being implemented, the international community shows an increased interest in the countries through which the branches of this road used to run. The former Soviet Central Asian republics are among them. The world's interest to the current affairs of these countries, their history and rich material and spiritual Silk Road heritage which has been preserved here, has considerably increased after these countries became independent. Present-day historians call Central Asia the brightest necklace in the treasury of the Great Silk Road. And it is not without grounds, as lots of unique ancient architectural monuments, cultural and spiritual wealth passed down to us by outstanding ancestors, national arts and crafts, traditions and holidays are being well preserved in Uzbekistan, Kazakhstan, Kyrgyzstan, Turkmenistan and Tajikistan. The number of people who want to visit Central Asian countries is growing all over the world. In this respect numerous guidebooks published in many languages become of great help. We recommend you first of all to turn to the following guidebooks. Rowan Stewart, Susie Weldon. Kyrgyzstan. The Kyrgyz Republic: Heartland of Central Asia. – Hong Kong: Odyssey Editions, 2002. – 284 p.(In English). Forming a natural border between the former Soviet Union and China, the majestic Tien Shan mountain ridges in Kyrgyzstan until recently made it impossible for travelers from abroad to get to this small Soviet republic. After the former Soviet Central Asian republics became independent, Kyrgyzstan became open to the world. Today a large number of tourists from different countries come to Kyrgyzstan in order to get acquainted with history and culture, customs and traditions of the hospitable Kyrgyz people, to see the country's remarkable ancient architectural monuments and natural sights. The guidebook deals with all these issues very thoroughly, and by now has been the only guidebook to Kyrgyzstan in English. Rowan Stewart showed a deep interest in Central Asia as far back as 1992, when for six months she happened to work as a tour guide around the region. The next year she made a bicycle thousand-mile journey along the Karakorum highway, and then traveled around Kyrgyzstan and neighboring countries. Susie Weldon, her co-author, is a journalist. She works for some English and Hong Kong newspapers and travels a lot about the Middle East and Asia. John King, John Noble, Andrew Humphreys. Central Asia. Lonely Planet travel survival kit. – Australia: Lonely Planet Publications, 1996. – 544 p.(In English). For almost two millennia Central Asia used to host the middle part of the Great Silk Road. The region was intersected by the roads along which the caravans from the East bound for Mediterranean countries and trade missions from the West made their journeys eastwards. This was the place where different cultures, religions and traditions met and enriched each other, contributing greatly to the development of the world civilization. Forming a united geopolitical region, Central Asian countries have their unique distinctive features: history, languages, cultures, industries, natural characteristics. That is why each country of the region - Uzbekistan, Kyrgyzstan, Tajikistan, Turkmenistan, and vast Kazakhstan - is dealt with separately in the guidebook. After the collapse of the USSR in the early nineties of the last century, these former Soviet republics became independent states. The guidebook tells about the history of these countries, about the rich Great Silk Road heritage preserved to the present day. Here the tourists are charmed by ancient towns, unique architectural monuments: palaces, mausoleums, fortresses and minarets. The diverse natural sights are fascinating too: sweltering deserts, alpine meadows, and snowy mountain peaks. The authors of the guidebook advise those who are planning a trip to Central Asia to get acquainted with ancient towns of Samarkand, Bukhara, and Khiva. They say that as you buy carpets and gold-embroidery caftans from a busy exotic bazaar and go to the traditional tea-houses to try the unique Oriental cuisine you will learn a lot about the hospitable people living in these countries. The guidebook, supplemented with 50 maps, provides information on Xinjiang autonomous district of China and Karakorum highway; it advises on customs formalities and transportation means to choose, and a lot of other nitty-gritty issues. Giles Whittel. Central Asia. – U.K.: CADOGAN guides, 1996. - 388 p. (In English). According to the author of this guidebook known as "CADOGAN Tourist Guide", stopping over at a caravanserai near the Sky Mountains, watching a rocket launch at Baikonur space center, staying overnight in a nomadic yurta at the foothills of "Father of the Icy Mountains", seeing the world-biggest nephritic gravestone of Tamerlane, buying a carpet in Ashgabat or a motor-bike in Almaty… - all this and much more you will be able to experience if you decide to make a journey along the branches of the Silk Road in Central Asia. 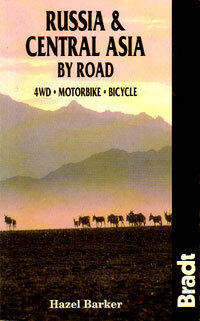 The guidebook provides information on tours across the vast area from the Caspian Sea to the Gobi Desert, from Kazakh steppes to the foothills of the Pamirs, including traveling along Karakorum highway and the recently built routes from the CIS countries to China. The guidebook tells about the history and culture of the Great Silk Road countries located in Central Asia, remarkable architectural monuments, diverse natural landscapes including majestic mountain chains, waterfalls, blooming oases and the sandy hills of sweltering deserts. The author stresses that a comfortable bus trip to the blue domes of Samarkand, the capital of Tamerlane's empire, or to Khiva and Bukhara with their narrow twisting alleyways decorated with minarets and mausoleums, a trip from Bishkek to Issik-Kul Lake can give you vivid and unforgettable impressions. He also notes that various travel activities, new hotels, comfortable means of transportation are available during such trips. Hazel Barker, David Thurlow. Russia & Central Asia by Road. 4 WD Motorbike, Bicycle. – U.K.: Bradt Publications; USA: The Globe Pequot Press Inc., 1997. – 278 p. (In English). Almost mystical lure of Russia and Central Asia is rooted in the remote past, when merchants used to carry their valuable goods along the ancient caravan road known as the Great Silk Road. In search of new markets they headed their heavily loaded caravans through mountains and deserts. Today many people dream about getting back to those times and mysterious lands. But until recently planning such a trip was impossible due to lack of information on the ancient caravan routes. This guidebook was written for the purpose of making up for this information deficiency. The author covers the most important planning aspects, gives financial advice, tells about the due documents and procedures, offers diverse itineraries and tours in Russia, Mongolia, Kazakhstan, Kyrgyzstan, Uzbekistan and Turkmenistan. The guidebook gives thorough information on the history, geography and culture of these countries, on the architectural monuments and various other sights to visit, on their languages and communicative means. Tips for travelers, including those on safety measures and health care, on transportation means to choose, spare parts supply, safe parking, stopover and eating points, all such aspects of travel are sufficiently covered by this guidebook. Maier Frith. 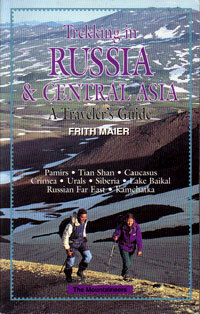 Trekking in Russia and Central Asia. – Canada: The Mountaineers, 1994, 1997. – 369 p.(In English). David Brower, the head of Earth Studies Institute, says that this is a wonderful guide to the immense, and frequently wild, Russian countryside. According to him, this book is intended to remind all those traveling to these lands that care should be taken about these unique lands. The vast territory of Russia has 11 time zones and comprises a diversity of highlands (the Urals, Altai, and Caucasus), steppes, rivers and lakes, forests, marshlands, seaside resorts (the Black Sea coast) and severe areas of Siberia and the Far East… Extremely interesting tourist routes which are able to satisfy the diverse tastes and abilities of the travelers have been worked out. 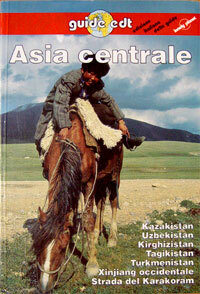 The guidebook also provides detailed information on Central Asia. Climbing the slopes of the Pamirs and Tien Shan, making trips to numerous lakes, glaciers, caves, various unique sights of the region - the itineraries include lots of such travel activities. The author, who has spent over 10 years on studying Russia and Central Asia, tells about it all in great detail. Bradley Mayhew, Richard Plunkett, Simon Richmond. Central Asia. – Australia, Lonely Planet Publications, 2000. – 575 p.(In English). "Ancient civilizations, awe-inspiring landscapes and intricate architecture - Central Asia is a challenging and fascinating destination" - this is how the authors represent their guidebook on Central Asia. This vast region, also called Turkestan, covers the area from the Caspian Sea in the West to Mongolia in the East, from Siberia in the North to the Hindukush in the South. The landscapes of the region give you the opportunity to see boundless sweltering deserts, steppes, and mountains. Since the 2nd century Central Asia used to hold the strategic branches of the Great Silk Road linking the West and the East. 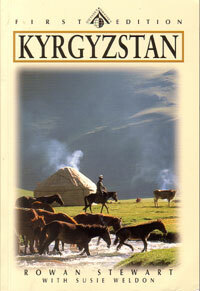 The guidebook provides detailed information on history, culture, and environment, tourist attractions of Kyrgyzstan, Tajikistan, Kazakhstan, Turkmenistan, Uzbekistan, the Xinjiang autonomous district of China, and Afghanistan. It also tells about the customs and traditions of the indigenous peoples of this part of the world and suggests the possible itineraries. The guidebook gives a lot of practical tips on getting visa and documents requirements, on embassies and consulates, on accommodation, etc. Klaus Pander. Zentralasien: Usbekistan, Kirgisstan, Tadschikistan, Turkmenistan, Kasachstan. – Germany, Keln: DuMont Buchverlag, Kunstreisefuhrer editions, 1996, 2000. – 384 p. (In German). Central Asia covers an immense area, with a variety of landscapes: boundless deserts and snowy mountain peaks, alpine meadows, waterfalls and rivers. Since the 2nd century Central Asia used to hold the strategic branches of the Great Silk Road linking the West and the East. The Great Silk Road stimulated growth of new towns along its branches, the emergence of scientific and cultural centers, development of crafts, arts, and agriculture. In Central Asia lots of monuments of material and spiritual culture, significant to all the mankind, have remained intact to the present day. The pages of the guidebook provide detailed information on the history of Central Asian countries beginning from the Stone Age, cover the pre-Islam and Islamic periods, focuses on the dissemination of Buddhism and Christianity along the Silk Road. 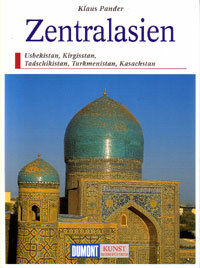 A large part of the guidebook is taken by the chapter devoted to Muslim art and culture in Central Asia, where a reader can learn much about the unique monuments of ancient architecture found on the territory of the region, about culture, sciences, various types of art, such as dancing, music, paintings, etc., local handicrafts, customs and traditions of the Uzbeks, Tajiks, Turkmens, Kazakhs, as well as about the today's life of the independent countries of Central Asia. The guidebook contains detailed information helpful for planning out a trip to the region, gives a lot of practical advice on getting visas, going through the customs, arranging accommodation, meals, excursions, etc. Wim van Ginkel, Els van Kuijk. Turquoise. Een reis door Centraal-Azie, Oost-Turkestan, Tibet, Pakistan en Iran. – The Netherlands: Elmar edition, 1997. – 302 p. (In Dutch). This book was written by the Dutch travelers Wim van Ginkel and Elle van Kuijk after their long traveling around the countries of Central Asia, Eastern Turkestan, Tibet, Pakistan and Iran. The authors are not just people who are full of wanderlust; they go into the essence of the life of the countries they visit, tell captivating stories about the history, culture and sights of the region. Having read this guidebook, many readers happen to decide to visit the countries it describes. In the Introduction the authors write that until recently it has been impossible for a large number of travelers to make a trip to Samarkand or Bukhara, but now these towns of the young independent Uzbekistan are open to the international community. 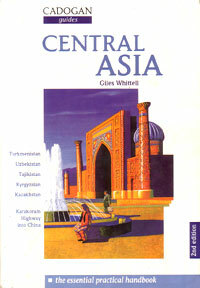 The book begins with a description of Central Asia, and the better part of it is about Uzbekistan. There are separate chapters on various tourist attractions in Uzbekistan - 'Tashkent', 'Bukhara', 'Samarkand', 'Ferghana Valley'. The authors tell about the history of Uzbekistan and the country's present-day life, about its unique architectural monuments and environment; they share their impressions of meeting the local people. They write that they saw mosques and temples, busy bazaars, monumental towns and lovely mountain villages, and that they met lots of people whose life in some respects seemed a bit different from whereas in general was similar to the one the Europeans got used to. The authors also mention the military campaigns of Alexander the Great, Genghiz Khan, and Tamerlane, as well as Marco Polo's travels around Central Asia. Rowan Stewart, Susie Weldon. Kyrgyzstan. The Kyrgyz Republic: Heartland of Central Asia. - Hong Kong: Odyssey Editions, 2002. - 284 p. (In English). * John King, John Noble, Andrew Humphreys. Central Asia. Lonely Planet travel survival kit. - Australia: Lonely Planet Publications, 1996. - 544 p. (In English). Giles Whittel. Central Asia. - U.K.: CADOGAN guides, 1996. - 388 p. (In English). Hazel Barker, David Thurlow. Russia & Central Asia by Road. 4 WD Motorbike, Bicycle. - U.K.: Bradt Publications; USA: The Globe Pequot Press Inc., 1997. - 278 p. (In English). Maier Frith. Trekking in Russia and Central Asia. - Canada: The Mountaineers, 1994, 1997. - 369 p. (In English). Bradley Mayhew, Richard Plunkett, Simon Richmond. Central Asia. - Australia, Lonely Planet Publications, 2000. - 575 p. (In English). Klaus Pander. Zentralasien: Usbekistan, Kirgisstan, Tadschikistan, Turkmenistan, Kasachstan. - Germany, Keln: DuMont Buchverlag, Kunstreisefuhrer editions, 1996, 2000. - 384 p. (In German). Wim van Ginkel, Els van Kuijk. Turquoise. 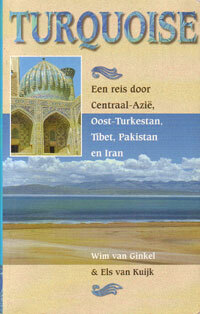 Een reis door Centraal-Azie, Oost-Turkestan, Tibet, Pakistan en Iran. - The Netherlands: Elmar edition, 1997. - 302 p. (In Dutch). Gilles Whittel. Asie Centrale: Turkmenistan, Ouzbekistan, Tadjikistan, Kazakhstan, Kirhistan, Karakoram Highway, Xinjian. - Switzerland, Geneve: Guides Olizane Aventure, Editions Olizane, 1998. - 512 p. (In French). Herve Beaumont. Asie Centrale: Ouzbekistan, Tadjikistan, Kirghiziststan, Kazakhstan, Turkmenistan, Xingiang. - France, Paris: Guides Marcus Editions, 1998. - 96 p. (In French). Dominique Auzias, Jean-Paul Labourdette. Le Petit Fute. Asie Centrale. Le Guede de L`asie Centrale: Kirghizistan, Ouzbekistan, Tadjikistan. - France: Nouvelles Editions de L`universite, 2001. - 321 p. (In French). John King, John Noble, Andrew Humphreys. Asia Centrale: Kazakistan, Uzbekistan, Kirghizistan, Tadgikistan, Turkmenistan, Xinjiang occidentale Strada del Karakoram. - Italy, Torino: Copyright per l'edizione italiana, 1997. - 595 p. (In Italian). Bradley Mayhew, Richard Plunkett, Simon Richmond. Asia Centrale: Kazakistan, Uzbekistan, Kirghizistan, Tadgikistan, Turkmenistan, Xinjiang, Afghanistan. 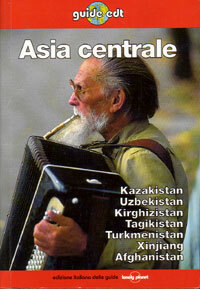 - Italy, Torino: Lonely Planet Publications, Copyright per l'edizione italiana, 2000. - 669 p. (In Italian). Turaj Atabaki, Joris Versteeg. Centraal-Azie: Mensen, Politiek, Economie, Cultuur. - The Netherlands, Amsterdam: Edition-Koniklijk instituut voor de Tropen, 1994. - 83 p. (In Dutch). Silk Road. Central Asia countries. - Japan, Tokyo: Ryokojin, 1999. - 376 p. (In Japanese). Guide-book Gio Globe Trotter. Silk Road and Central Asia countries, 2001-2002. - Japan, Tokyo: Dimond Big Co.Ltd, 2002. - 276 p. (In Japanese).